U-47's First Watch Officer (1.WO), Engelbert "Bertl" Endrass, was born on 2 March 1911 in the Bavarian town of Bamberg. Like Günther Prien, Endrass had been a member of the Merchant Navy before joining the Reichsmarine, where he served on a number of vessels including the cruiser Deutschland. At the end of 1937, he was transferred to the U-boat arm, joining U-47 in December the following year at the rank of Leutnant zur See. Leutnant zur See Endrass was to play a major role in creating the unique identity of both U-47 and its skipper; on the return journey following the successful raid at Scapa Flow in October 1939, he painted the unique "snorting bull" on the conning tower of the submarine. 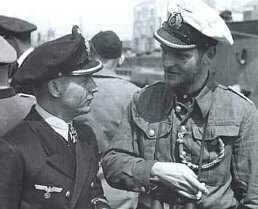 In December 1939 after U-47's third mission Endrass was provided further training, culminating in his promotion to Oberleutnant zur See and the command of U-47's sister vessel U-46 in May 1940. During his spell as 1WO on board U-47, Endrass had been awarded both the Iron Cross first and second class. Three contrasting portraits of Engelbert Endrass, Prien's 1WO and commander of U-46. Left: aboard U-46 after a successful patrol. Centre: talking with fellow Knight's Cross recipient Erich Topp. Right: Endrass in dress uniform, Knight's Cross with Oakleaves clearly visible. Like his former skipper Prien, the twenty-nine year old Endrass proved to be a more than able commander; his first patrol in May 1940 yielded five victims for over 35,000 tons, including the British auxiliary cruiser Carinthia, which weighed in at a substantial 20,277 tons. This was followed by an equally successful second patrol, sinking a further five ships for 27,038 tons. The figure included a second auxiliary cruiser, the 15,007-ton Dunvegan Castle. Following his return to Germany Endrass was presented with the Knight's Cross - an award that had been long overdue. Endrass was to serve as skipper of U-46 until September 1941, winning both the Oakleaves to the Knight's Cross and the coveted U-boat badge with diamonds during this time. Having been promoted to the rank of Kapitänleutnant in early July 1941, Endrass was then given command of a new boat, the Type VIIC U-567. The long run of success Endrass had seen both as 1WO of U-47 and skipper of U-46 was then to come to a sudden end. On his first patrol as commander of U-567, he ran into trouble north-east of the Azores in the shape of the British attack vessel HMS Deptford. Succumbing to the Deptford's depth charge attack, U-567 went down with all hands on 21 December 1941. Engelbert Endrass was one of the most successful U-boat commanders of the war. At the time of his death in December 1941, he had been responsible for the destruction of twenty-four enemy vessels at over 120,000 tons.